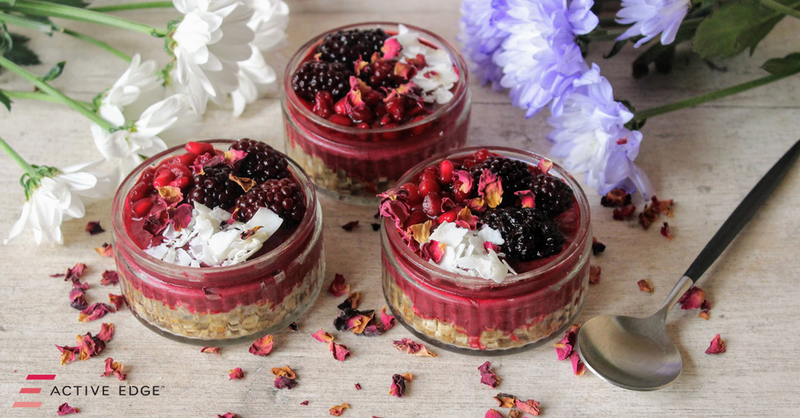 These cheesecake pots from SpamellaB would make the perfect end to a meal or you could even have them for the breakfast. First make the base: Mix together the oats and coconut in a bowl. Melt the coconut oil and pour in along with the maple syrup and mix everything together. Spoon between 3 individual dishes or ramekins (fill about ⅓) and press down with the back of a spoon. Set aside while you make the filling. Scrape the solid part of the coconut cream from the can and place in a bowl along with the pomegranate concentrate, maple syrup and vanilla. Use an electric whisk to beat for a few minutes until thick and creamy. Divide this between the pots to fill the top. Arrange your decorations on top then chill for at least 30 minutes – then enjoy!